Norma Rae reputation rightly rests largely on the small but steady shoulders of Sally Field, who anchors this film with equal parts grit and heart. 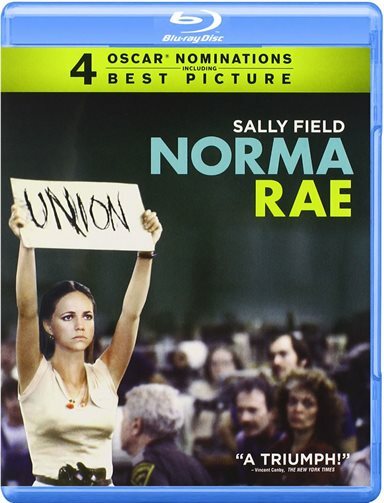 Lots of people probably rolled their eyes when Sally Field was announced as the star of Norma Rae, Martin Ritt's 1979 film about a blue collar union activist in the Deep South. Sally Field? In 1979, Field was hardly the celebrated actress she is today. Sure, she had proven her acting bona fides in the television movie Sybil, but for many she was still Gidget or, even more problematically, The Flying Nun. Field had appeared in several big screen efforts, going back as far as 1967's The Way West and continuing on through films like 1976's Stay Hungry, but in the seventies her theatrical films were mostly less than stellar outings with her then main squeeze Burt Reynolds, though it's perhaps somewhat humorous to note that Field's other 1979 film was that all time classic Beyond the Poseidon Adventure. But Field turned out to be a major revelation in Norma Rae, delivering a wonderfully sweet but steely performance that ended up winning her the first of her two Best Actress Academy Awards. Norma Rae was in a way Field's coming out party as a major actress, and it remains as one of the highlights in what is now Field's storied and much accoladed career. Norma Rae touched a lot of hearts when it was originally released, and of course Field's performance was a major reason why, and so I may raise a few hackles when I suggest the film is a bit too sentimental for its own good, as well as not particularly well structured. We're introduced almost immediately to Norma Rae's fiery temperament when she berates the doctor at the cotton mill where she (and just about everyone in her town) works after it becomes apparent to her that her mother Leona (Barbara Baxley), who also is employed there, is suffering from one of the mill's collateral damages—temporary deafness. In fact, the overpowering sonic environment of the mill is one of Norma Rae's most subliminally harrowing elements. That affliction passes quickly, and Leona is fine by the time the film segues to Norma Rae's home life with her two young children and her father Vernon (Pat Hingle). Vernon seems a bit overprotective (some might even allege interested) in his daughter, though it quickly becomes apparent that Norma Rae has not had the best judgment in men. A stranger at their door interrupts an incipient argument between Norma Rae and Vernon, and gives Vernon a new target to vent his rage upon. The stranger is union activist Reuben Warshowsky (Ron Leibman), who has just arrived at the not very welcoming town to try to unionize the mill. Reuben attempts to whip up support for the union, though his efforts initially fall on deaf ears. In one of a couple of unexplained plot points, he confesses to Norma Rae one night that she was always the "fish" he wanted to "hook". In another somewhat undeveloped and tandem plot point, Norma Rae is given a short-lived promotion at the mill which makes her a temporary pariah among her friends, and she finally demurs the new assignment and returns to her line work. But the experience has perhaps alerted her to the fact that there's an incipient unity among the workers that is waiting to be exploited. In the meantime, Norma Rae initially has a bad interaction with a kind of crazy guy at the mill named Sonny Webster (Beau Bridges), and (of course) a romance soon blossoms, with one of the most touching but peculiar proposals following rather quickly. The second half of the film then details Norma Rae's increasing activism, while she also attempts to balance her new home life with Sonny, who looks on slightly askance at her relationship with Reuben. Norma Rae frankly deals in shorthand a bit too much, simply cutting to the chase at several key moments instead of building momentum slowly. That may actually shortchange the drama somewhat, for Norma Rae's evolution isn't particularly well served by any circumstances within the film. She starts out as a firebrand, and then she's simply more of one as the story goes on. What ends up saving the film from its own deficits is the wonderfully heartfelt performances. Norma Rae's force of will is countered by a surprising vulnerability, and her self effacing comments also provide some nice humor. Leibman is nicely nuanced as Reuben, a wandering Jewish stranger in a very, very strange land. The scenes in the middle part of the film where it becomes clear that Reuben has more than a mere "professional" interest in Norma Rae are incredibly touching and provide a lot of the film's ultimate emotional heft. Bridges is also sweet and moving as the ultimate good guy, one who doesn't mind Norma Rae's spotty history or in fact her present rabble rousing. Ultimately Norma Rae is ironically a story about individual empowerment, an idea that is perhaps antithetical to the concept of unionization. But with an individual like Norma Rae as leader, other individuals are bound to follow. Norma Rae is presented on Blu-ray courtesy of 20th Century Fox Home Entertainment with an AVC encoded 1080p transfer in 2.39:1. Norma Rae is not a "pretty" film, intentionally so. Ritt and cinematographer John A. Alonzo emphasis the grimy, gritty and awfully drab lives that the mill workers face day in and day out, and that results in imagery that is pretty much devoid of any significant "pop". The overall look of this transfer is a bit on the soft side, and while contrast is very strong and consistent, the many dark scenes in the film are lacking significant shadow detail and in fact in a couple of instances are almost too dark to really see. Norma Rae's lossless DTS-HD Master Audio Mono track retains generally good fidelity, though highly attuned listeners will hear just a hint of distortion in the lower midrange, something that is minimally apparent in the literally deafening confines of the mill scenes, as well as perhaps a bit more unfortunately in the opening credits' rendition of the Oscar winning "It Goes Like It Goes"). This is admittedly a very miniscule problem, and one that does not noticeably affect the film's dialogue, which comes through cleanly and clearly. Hollywood Backstory: Norma Rae is a good overview of the production, detailing some of the hoops Ritt had to jump through to get the film made. Norma Rae reputation rightly rests largely on the small but steady shoulders of Sally Field, who anchors this film with equal parts grit and heart. The film itself has a few problems with plotting and structure, but nothing that can ultimately detract from the power of the central performances. Ritt's intentions are completely clear from the get go here, and those who find the union ethos anathema may not cotton (sorry) to the film's central thesis, but even those on the management side of this particular issue may secretly be rooting for Norma Rae and her cohorts as the film careens toward its moving climax. For more information about Norma Rae visit the FlickDirect Movie Database.